I have to admit that I thought Friday night’s game against the Astros was going to be a struggle. The Yankees did not arrive in Houston until 6 am after playing and the losing the rain-delayed game in Chicago the night before. They arrived deep in the heart of Texas to play MLB’s best team and were scheduled to face the very tough Lance McCullers, Jr, the son of a former Yankee. It was noted before the game that McCullers had not given up more than three runs in any of his home starts this year. Against the Yankees, he was 2-0 with 0.75 ERA since 2016. 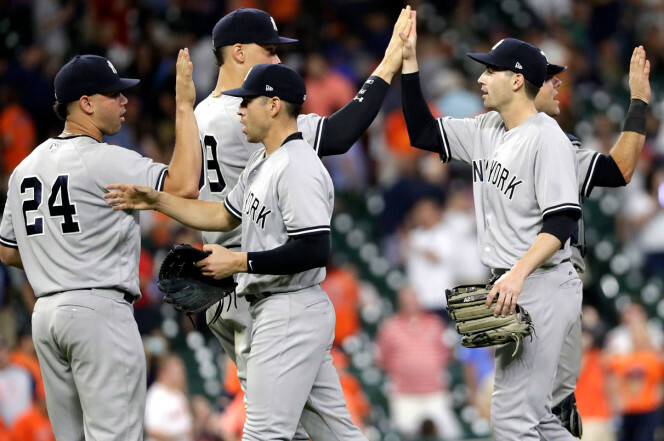 Fortunately, the Yankees came together as a team…as they’ve frequently done this year…and came away with the decisive victory. Early on, it looked like it was going to be another struggle for runs that would potentially come up short. The Astros scored their first run in the bottom of the inning when George Springer led off with a double against Yankees starter Michael Pineda. 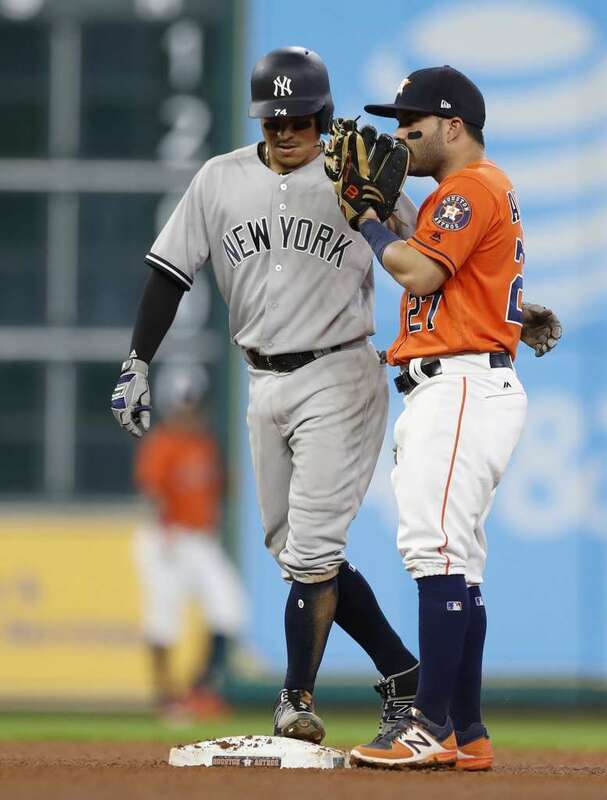 He moved to third on a ground out and scored on a sac fly by All-Star second baseman Jose Altuve. The Yankees picked up a run to tie the game in the third. Brett Gardner led off with a double when the ball dropped in despite a running dive by Astros right fielder Josh Reddick. It looked like McCullers might escape when he struck out the next two batters, but Didi Gregorius doubled down the first base line to score Gardy. The Yankees had two runners in scoring position in the top of the 4th with no outs. Unfortunately, both Tyler Wade and Chris Carter struck out. The inning was over when the runner on third, Austin Romine, attempted to score on a wild pitch. 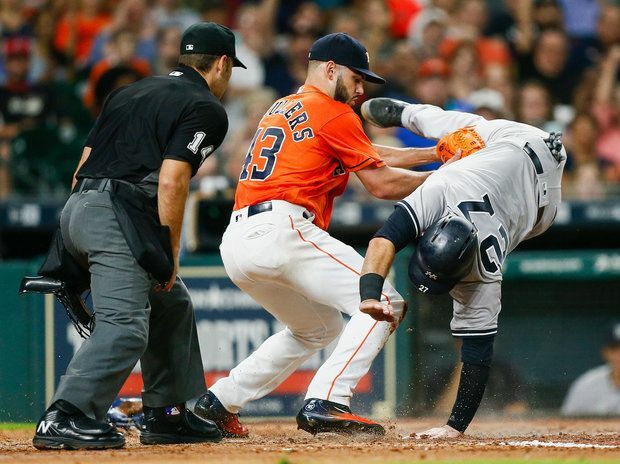 Nice trick slide though as Romine tried unsuccessfully to evade the tag. In the bottom of the 4th, the Astros led off with two singles. A throwing error by right fielder Tyler Wade put runners at second and third. After former Yankee Brian McCann struck out, another former Yankee, Carlos Beltran, hit into a ground out which scored the lead runner. Marwin Gonzalez followed with a single to score a run and the Astros led, 3-1. With McCullers Jr pitching well, it looked like it would be difficult to make a comeback. But the light at the end of tunnel occurred in the sixth inning. Didi Gregorius opened with a single. After Chase Headley struck out, Austin Romine walked and the Astros made a pitching change. They brought in Michael Feliz to replace McCullers Jr. Ronald Torreyes greeted Feliz with a single to left, scoring Gregorius. Tyler Wade struck out for the second out, but Chris Carter, Brett Gardner, and Jacoby Ellsbury followed with run-scoring singles to put the Yankees up, 5-3. A fielding error allowed Gardy to advance to 3rd. He scored the fifth and final run of the inning when Feliz threw a wild pitch. 6-3, Yankees. I really hated to see Feliz go but the Astros brought in Reymin Guduan and he secured the final out. Nevertheless, the 7th brought more Yankee offense. Chase Headley and Austin Romine opened with singles, and Ronald Torreyes walked to load the bases. Tyler Wade hit a grounder that erased Headley at home and Chris Carter (wait for it) struck out. So, with two outs and the bases loaded, Brett Gardner, who largely struggled during the month of June, came to the plate. On a 3-2 count, Gardy put one over the right center field wall for the grand slam (his 15th homer of the year, and just two away from his career high). With the seven run lead, Michael Pineda’s night was finished. Much better results than the last time Pineda faced a Texas team. Pineda (8-4) went 6 innings and allowed 7 hits, 3 runs (2 earned), and struck out 3. He didn’t walk anybody and more importantly, he didn’t give up any home runs. It wasn’t a perfect outing but he gave the Yankees exactly what they needed…a fighting chance until the offense got untracked. The Astros picked up a meaningless run in the 8th when Josh Reddick opened with a double and advanced to third on a throwing error by Jacoby Ellsbury. He scored when Jose Altuve grounded out. Despite a subsequent single allowed, Bryan Mitchell, who had relieved Pineda in the 7th, was able to get out of the inning without any further damage. The Yankees tacked on three more runs in the 9th. Ronald Torreyes and Tyler Wade both walked. Chris Carter struc…I mean…doubled to score Torreyes. 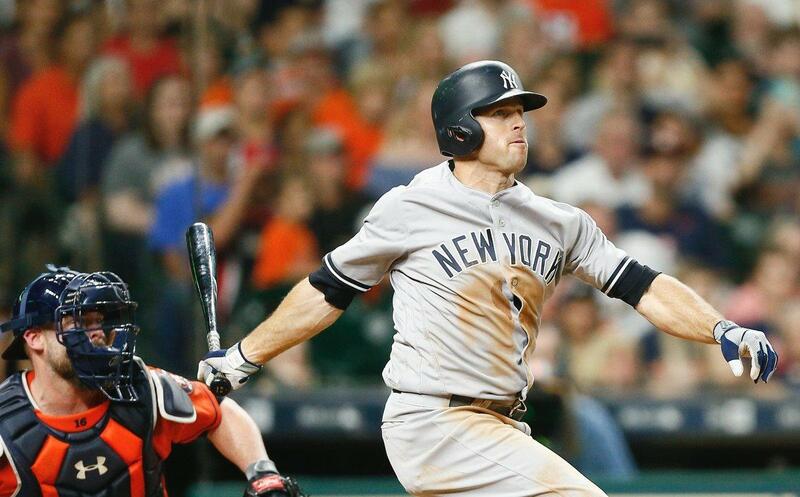 Brett Gardner lofted a sac fly to right to score Wade, his 6th RBI of the game. Jacoby Ellsbury hit into a groundout, scoring Carter. The runs gave the Yankees the final margin of victory, 13-4. Bryan Mitchell set down the Astros in order in the bottom of the ninth to earn his first save of the season. 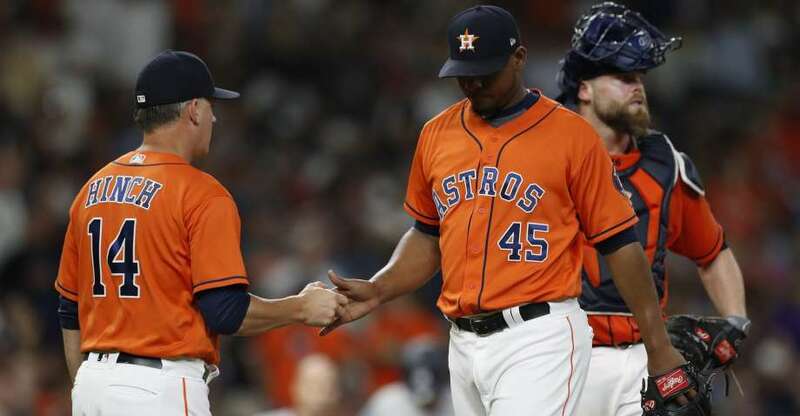 Great job by Mitchell to protect the bullpen and to keep the Astros down. The Boston Red Sox defeated the Toronto Blue Jays, 7-4, in 11 innings, so the Yankees (43-35) remain one game behind in the AL East Standings. The Tampa Bay Rays also won in extra innings (6-4 over the Baltimore Orioles) so they are still 3 games behind the Yankees. This was a great team victory. All of our hearts are with Yankees outfielder Dustin Fowler as he begins his recovery from knee surgery on Thursday night. It will be a long, hard road of recovery and rehabilitation. It’s been reported that he’ll be on crutches for three months before he begins physical therapy. Everyone is hopeful that he’ll be ready by the time training camp in Tampa opens next February. I thought it was cool the team had a face-time call with Fowler in Joe Girardi’s office before yesterday’s game. In the aftermath of Fowler’s devastating injury, the Yankees made a few expected moves on Friday. With the placement of Fowler on the 10-Day DL and the demotion of Ronald Herrera to Triple A, the Yankees recalled RHP Bryan Mitchell and 3B Miguel Andujar. For Andujar, he returns as a Major League Vet albeit with just one game under his belt. But it will be hard for him to match that terrific first impression (3 hits, 4 ribbies). I hope his defense is ready to play at the MLB level. I’d like to see him get a few turns at third as an alternative to Chase Headley and Ronald Torreyes. I am glad to see that Mitchell is back. He is a Major League pitcher that just gets caught in the numbers game. But he’s always been one of my favorites. Best of luck…and health…to both men. 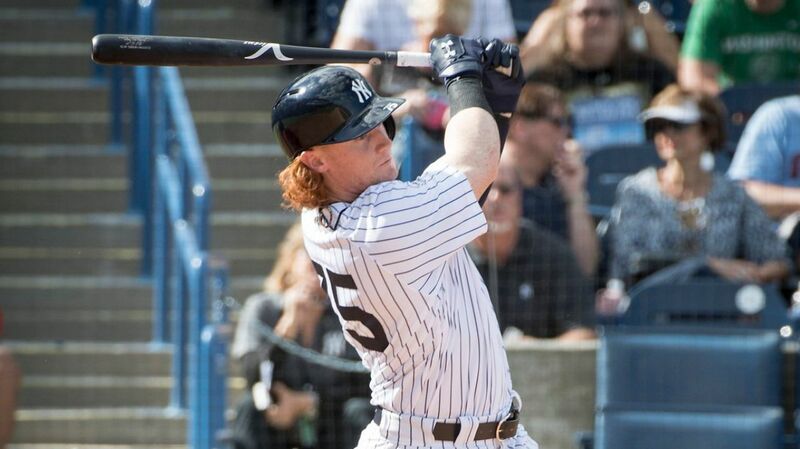 Clint Frazier, according to multiple reports, will be called up today for his first trip to the big leagues. I was surprised when the Yankees recalled Miguel Andujar after previously saying they wanted him to get more reps at third. Nothing against Andujar and of course he had the greatest possible MLB debt performance, but the Yankees have a greater need in the outfield. Rob Refsnyder is not the right answer to rotate with Brett Gardner, Jacoby Ellsbury and Aaron Judge (keeping those guys fresh). I’ve heard the most likely candidate to be sent down will be reliever Bryan Mitchell who made an extended appearance in last night’s game in relief of Michael Pineda. I assume that Andujar is another potential candidate for the trip to Scranton, PA. He was a convenient call-up for the Yankees following Fowler’s injury because he was still in Chicago. Frazier will be the 10th Yankee to make his MLB debut this year (counting Fowler’s very brief appearance). CC Sabathia pitched a simulated game on Thursday and is expecting to make his next start. I assume that Luis Cessa will be return to Scranton when Sabathia is activated off the DL. Still no word about Matt Holliday as tests continue. This is a bit frightening, to say the least. I really hope this is not something more serious than we’ve been led to believe. Tyler Clippard was away from the team on Friday to attend his grandmother’s funeral. He is expected back today. Have a great Saturday! Even better if the Yankees can pull out a second victory against a very tough Astros squad. Let’s Go Yankees!